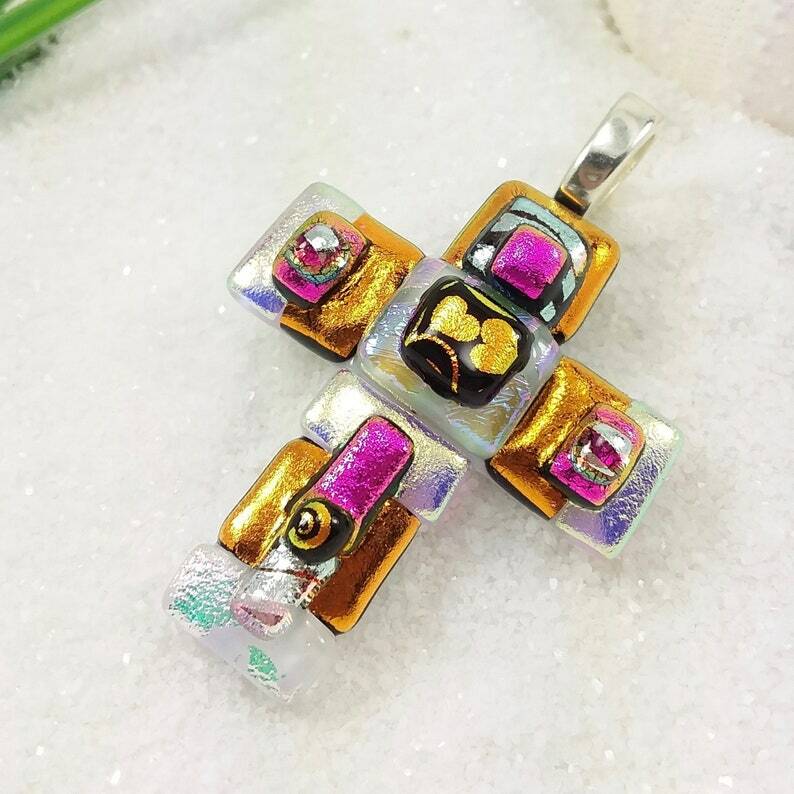 Dichroic glass cross pendants are handmade to be worn and cherished for years! What a lovely way to show your faith! This lovely and VERY colorful dichroic pendant is perfect for simple weekends, jeans and t-shirts. Or how about dressing up for going out for the evening? These multi-colored style of dichroic pendants look fantastic with t-shirts, dressy tops and even dresses! The possibilities are endless! Set with sterling silver bail. All of my pendants are made from thin glass and because of that, they are VERY light! Like a garden of heaven's flowers! A beautiful cross to represent what is most important to you. Be chic while showing your faith! We started with a base of pure Snow White. Then, we added dichroic colors of shimmery light yellow, hot pink orange hearts, silver and even luscious orange!! Simply breathtaking! You can wear with your favorite chain or cord! (not included).